Enlarged isometric diagram of Lorica Segmentata "Corbridge" Armor Type-B. Note that the shoulder guard components are connected to the torso girdle section by bronze hooks and eyes, instead of by straps and buckles, as used on the Corbridge Type-A lorica armor. This was a later style of the Corbridge type lorica segmentata armor and retained most of the wearing comfort of the Corbridge Type-A. 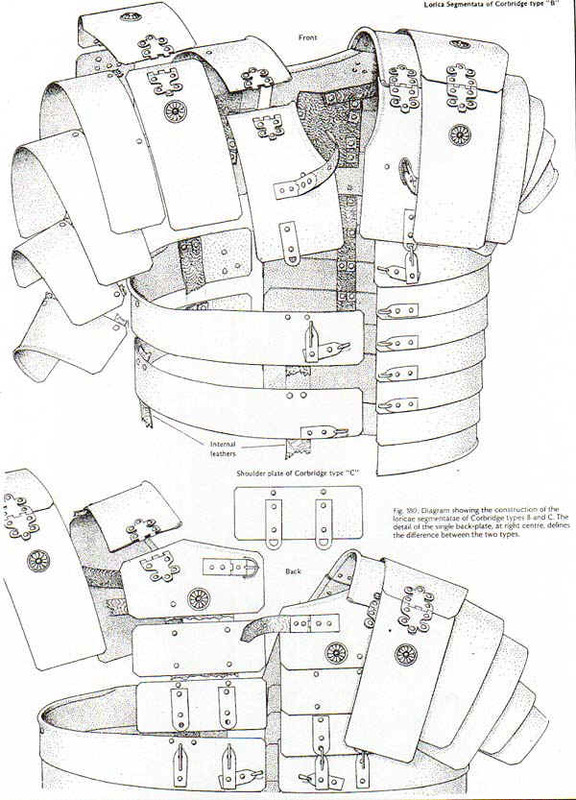 The "hook and eye" connections, along with one less girdle plate (7 versus 8 for the Corbridge-A) simplified its construction and assembly. Also, the shape of the main shoulder guard plates varied from those of the Corbridge-A. The "B" style had wider collar plates providing somewhat more coverage and protection for the chest and upper back. The shoulder hinges were of a slightly simpler and less decorative design. The Corbridge-B is an example of the steps taken to simplify the manufacture and lower the costs of equipment when many thousands of the same item are required to be made and supplied. The even later "Newstead" type lorica segmentata, adopted toward the end of the First Century AD, carried this principle even further with a more durable, stronger and simpler design, but with a loss of some comfort for the wearer.